Interview with PC Gamer UK for February. What was your inspiration for creating the mod? Our main inspiration for the mod was the Doom series and Starcraft. I?m a huge fan of the earlier Dooms, but when I played Doom 3 I was disappointed with the slow-paced gameplay (not to mention the heartbreak of not having a double barrel shotgun). At the same time, Altheus (Scott Penner) and I had been wanting to create a game or mod together for a while and thought that the Doom 3 engine was the best choice presently at hand. While I was having daydreams of more action from Doom 3, Altheus said to me ?Why don?t we create a mod based on those custom Starcraft maps where you have to hold off against swarms of attacking enemies?? 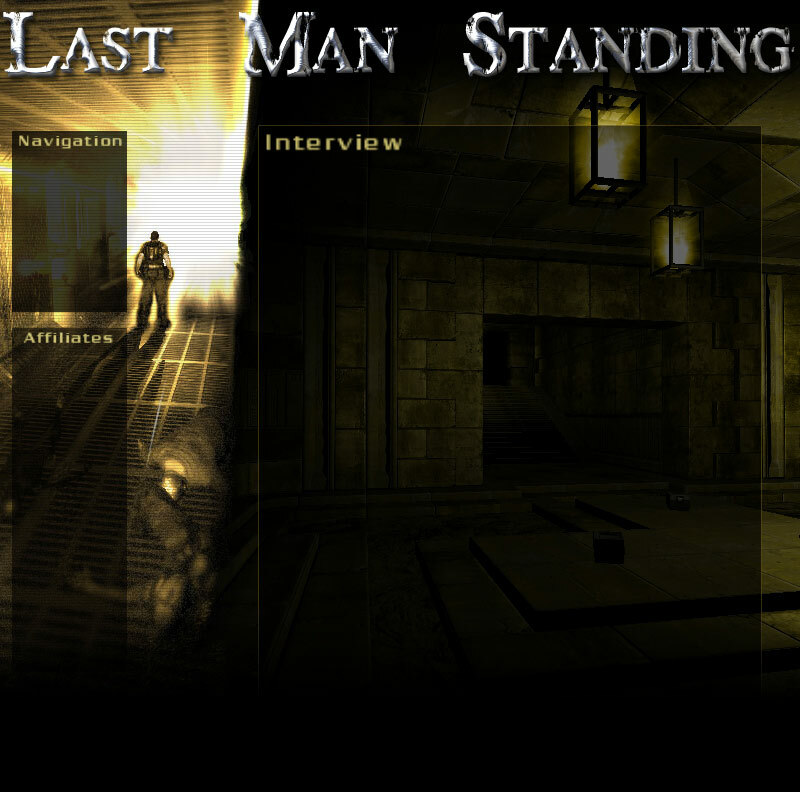 and thus, with the awesome help and support of our webmaster Burn (Balal Aizaz), Last Man Standing was born. How does the game mode influence the type of maps you're creating? For example are you creating single arenas in which zombies just pour in or will players move around corridors and room to room? The game mode influences the maps in the sense that we are aiming to incite panic in the players, making them feel the need to retreat. We do have maps that fit the single arena setting you mentioned such as Fortcomp10, where the action is centered around a small area of swarming monsters. We also have maps that are more expansive such as Beerman's (Dan Mayhew) Loading_dock map. This map features doors you will have to hack through, vacuums that need to be sealed off, escaping on a train, and battling it out in a coliseum. The great thing about this mod is that we are able to create an endless variety of maps that will hopefully each be entertaining and interesting in their own way. In addition I would like to mention that Timbobsteve (David Dyball) is working on a script that will add more monsters to the map depending on how many players there are. I think that is extremely exciting, because it will mean unlimited replay value as players can keep increasing the difficulty of the map. What kind of environments are you including in your maps? Our environments are mainly going to be based on Id's, but there is always the option to create new ones as the mod grows. I have thought about some map ideas that would take place on Earth, but none of those concepts will come into fruition until our mod is further along. I would like to point out that to further enhance the environmental "feel" and energy of the mod, we have enlisted the help of the band Neurosphere located at http://www.neurosphere.it/. They will be providing our maps with heavy metal soundtracks and are helping us develop various sound effects and voiceovers. We are extremely excited to have them with us! Can you talk us through some of the new weapons you're adding? Which is your favourite and why? The weapons we are planning to add to our first release is the "plasmathrower" and double barrel shotgun. The plasmathrower is essentially a flamethrower that launches bursts of blue plasma. The double barrel is most likely going to feature shot shells (as opposed to slug) and be a technologically upgraded version of the original double barrel. Of course it is the double barrel shotgun that I am most looking forward to. In the older Dooms whether it was against cyberdemons or enemy hordes big enough to crash my Playstation, the double barrel shotgun was always my weapon of choice. Are you adding any new monsters to the game or perhaps tweaking existing ones? This release won't have any new monsters, but future releases will. We are also thinking about tweaking existing monsters to make harder versions, distinguishable by new skins and whatever other cool features we can change. Currently I've been focusing on the maggots because I think an upgraded, stronger, faster, cooler looking version of them would be an absolute blast to fight off. You mention that hacking skills will come in handy? How will Marines use these skills in your mod? The hacking that you will most likely see in the upcoming release will involve one player occupied at the terminal with a bar indicating his/her progress, while the other player(s) will have to defend the hacker. So currently hacking doesn't require much skill, but defending the hacker will. There is certainly room to make hacking more intricate in the future. In reference to the hacking concepts, we are also considering options for players to control defensive equipment. This may include the ability to control turrets and sentry robots, seeing what they see through a computer monitor. Also we hope to include vehicles eventually. And these are only the beginning of the possibilities. What happens when players die? Can they spectate on the reamaining players? are you thinking of allowing players to respawn and perhaps receive a handicap or penalty? How to handle this situation hasn't been completely decided, mainly because we are trying to focus our energy on getting coop to work at an even basic level. Most likely though dead players will be able to spectate the other living players until the end of the map. You say on your site that you're planning some kind of release in the New Year ? are you still on track for this? I think that we should definitely be able to reach our goal of a New Year release. The only thing that might push that back is if it looks like we might be able to add in coop. The progress we are making lately in the mod is astounding and there is definitely no shortage of excitement and energy. I couldn't be more proud of the Last Man Standing team. Awesome work guys! First, I'd like to thank the Last Man Standing team. Working with you guys has been an absolute honor. I'd like to give a special thanks to Burn (Balal Aizaz) for his unyielding help and dedication. He has been there 100% for me every step of the way, even when things were looking bleak. I'd like to thank Altheus (Scott Penner) too for his help in creating the concepts for the Mod, his webpage layout and the advice he has given me on my maps. Also I'd like to thank Timbobsteve (David Dyball) and Beerman (Dan Mayhew) for the outstanding effort that they've put into the mod. They are a constant inspiration to the team. In addition I want to thank Link, (Andre Hindersmann) who has been a huge help to us, though currently he is inactive due to his computer failing. I'd also like to thank Sgt.Commander Neurosphere (Fabrizio Oliva) for his quick and timely help on the music and sound front. To the rest of the team members, SirVentolin, Spawn-FT, Mercykiller (Stephen Youts), and xXBlooDjunkiEx, thanks so much for everything, it has been my pleasure to work with each one of you. There isn't enough room in this magazine for me to express how great I think you all are. A special shoutout needs to go to my Best Friend Mark Leone. He has constantly supported me in so many areas such as the Mod, this interview, my personal life, etc. I don't even want to think where I'd be without all his help. Best of wishes on your upcoming Marriage! And finally, I'd like to give a huge thanks to PcGamer and Mark Sutherns for giving us this awesome opportunity. I'd really like to thank Mark Sutherns too for his friendly and courteous assistance throughout this interview process. I probably asked him more questions than he asked me! Poor guy! Thanks for your patience! Once again, thank you everyone who has helped to make this all possible.